It’s a paradise resort infested with the reanimated corpses of tourists; the beach is warm and the public is running in fear — it’s a great day to hunt zombies. 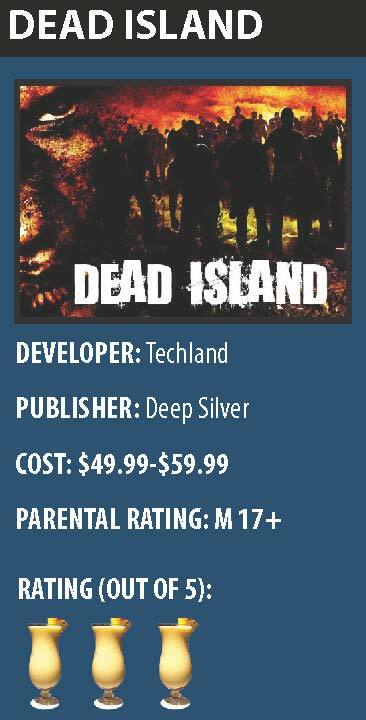 “Dead Island” is a first person slasher/shooter game that takes players through a relaxing getaway, the city slums and a prison isle with the option of being one of four heroes. Sam B, Xian Mei, Logan Carter and Purna are all selectable characters and each has a special set of skills and history that makes them unique. The first things players will notice about “Dead Island” is that zombies are exactly what they were meant to be: overwhelming. Anything more than a few walking corpses becomes an intense struggle for survival. This shifts the gameplay from eliminating every threat you see to making a mad dash towards the nearest door. This type of play may be created by the clunky mechanics that makes navigating around obstacles and swinging a makeshift weapon difficult. Its fun to use guerrilla tactics on your slow and misguided enemy, but its not as entertaining when getting mauled to death because you couldn’t cut a corner sharp enough. Aside from the awkward movement, the game play is very addicting. The open world lures you away from safety and promises reward for your courageous pursuit through hordes of undead. You’ll constantly come across things to use, need it be weapons, food or other random junk. The nails and duct tape you find now can possibly be used to modify your artillery later. Feel free to experiment, as there isn’t a lack of test subjects on this island. Just like weapons, player stats can be customized using the skill tree. Gamers earn experience doing missions and fending off the undead. Players can than use that experience to buy points on any of the skill tree’s. This makes each character a little more dynamic to what the individual player wants. The characters in “Dead Island” are stale, ruining the emotional appeal that was showcased during the announcement trailer. Before this preview, no one had a clue what “Dead Island” was and the results of showing this trailer is what skyrocketed game sales this year. The announcement trailer is extremely misleading, this is not a game about creating human ties or watching things in reverse. This is a game about fighting off the “Army of Darkness” and doing tedious task for experience. And on your journey across the sand and waves you may observe your characters odd habbits. All characters openly talk to themselves but for some reason have a problem interacting with the other survivors. This makes conversations between the heroes and quest givers seem more like a monologue, in which they order you around to do odd jobs, much like a parent orders their child to do chores. The voice acting can be great, but the cardboard cut-out animation makes it hard to feel connected on an emotional level. Speaking of terrible graphics, why is it that players can mow down thousands of zombies, but can’t plow over a sandcastle? On release date “Dead Island” was buggy, but even as Techland pushes out updates there are just few mechanics that keep this game from being great. The tale of “Dead Island”is part of that. But it’s a good game with little things holding it back. For what its worth, “Dead Island” is a solid play that any zombie fanatic should love, but for everyone else it would be highly recommended as a rental or bought on sale. “Dead Island” gets three pina coladas out of five.